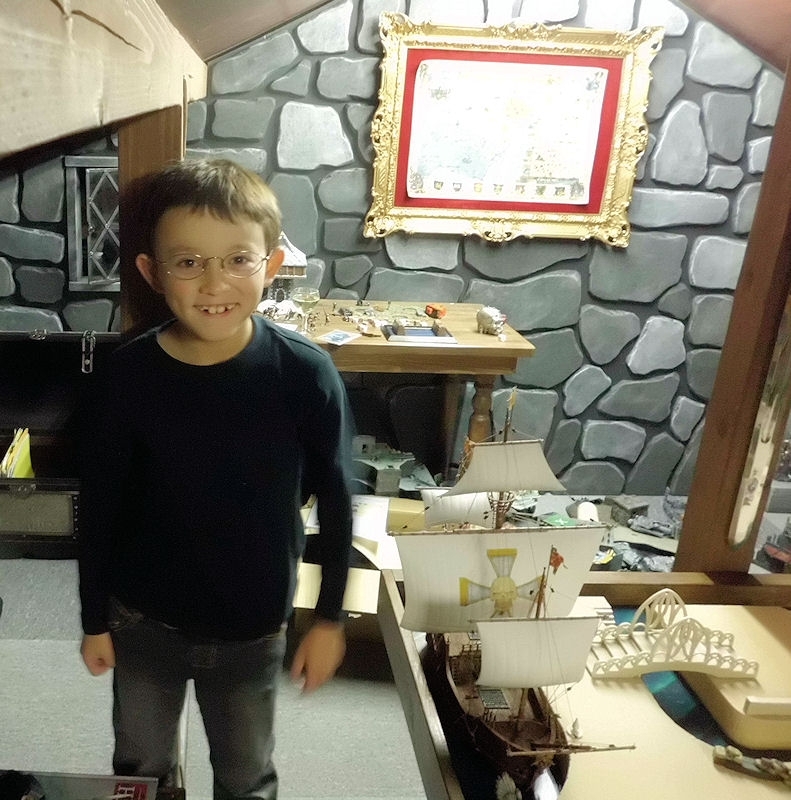 Euan is now almost 9 years old, and has been playing various miniature games for a couple of years. So we decided to have a full-sized (at least at our club) proper game of Warhammer at 1600pts, with full rules for everything, including magic for the first time. He has always been a fan of the dark elves, so I reckon he's going to love their magic spells! What better way to start than on our newly completed High Elf port board. 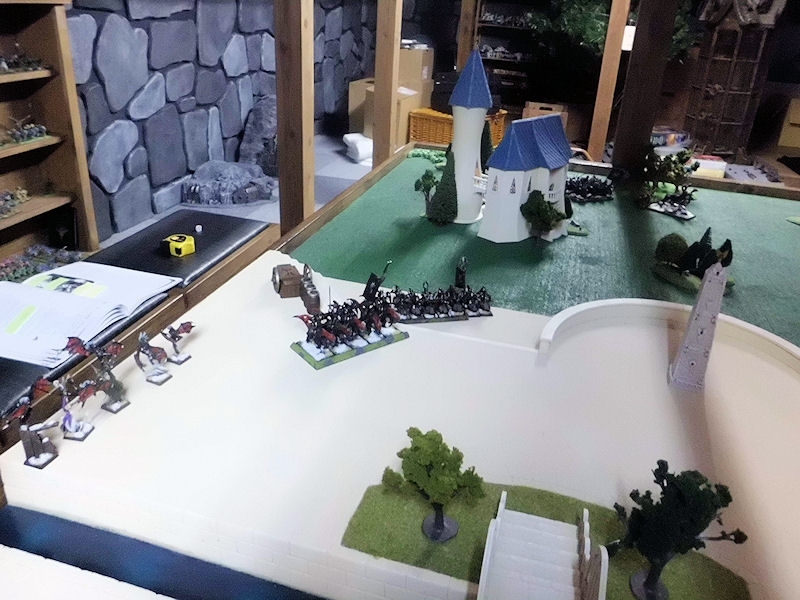 However that board is only half size, so we backed it onto a green grass board, and decided to set it up as the relaxed coastal retreat of a High Elf noble. Euan would be playing the invading Dark Elves, and I would be defending my realm with the golden-haired boys of Warhammer... High Elves. 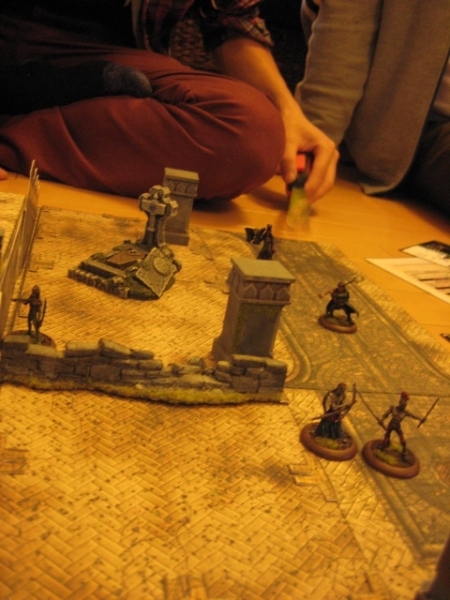 We rolled a 'Dawn Attack' for the scenario, which meant we'd be playing diagonally and starting very close together! Here's the board as we set it up. The port area at the top has a deep channel running across it, with two large bridges. The High Elf deployment area contains a large Empire trading ship, which can be used as a hill with surrounding walls in game terms. The only other features of note are a small ornamental garden on the High Elf side, and the large nobleman's mansion in the foreground. 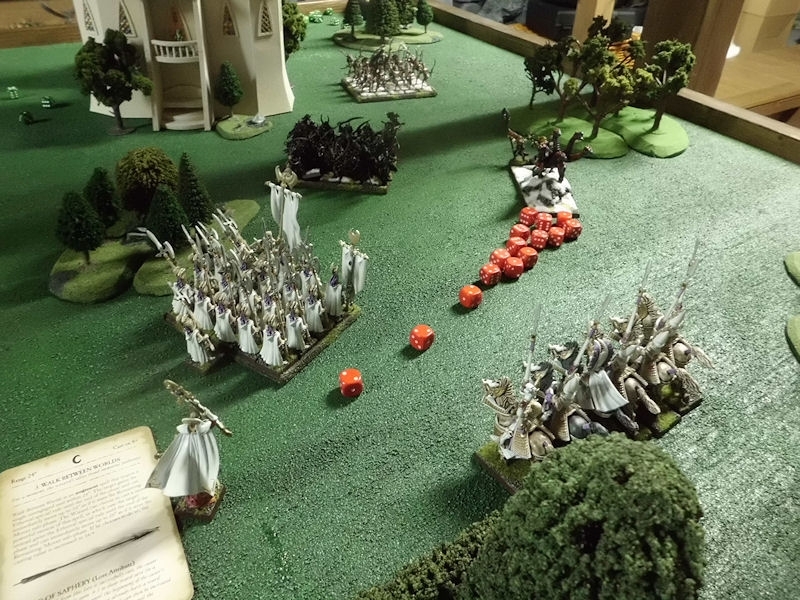 High Elves won the roll to deploy first, but completely messed up by having 5 out of 7 units roll ones to deploy, and therefore turn up late to the game! Only my six Silver Helms and a Lion Chariot actually turned up before the battle, the others no doubt still in bed! I placed the Lion Chariot close to the enemy, but in the relative cover of a bridge (top of photo). 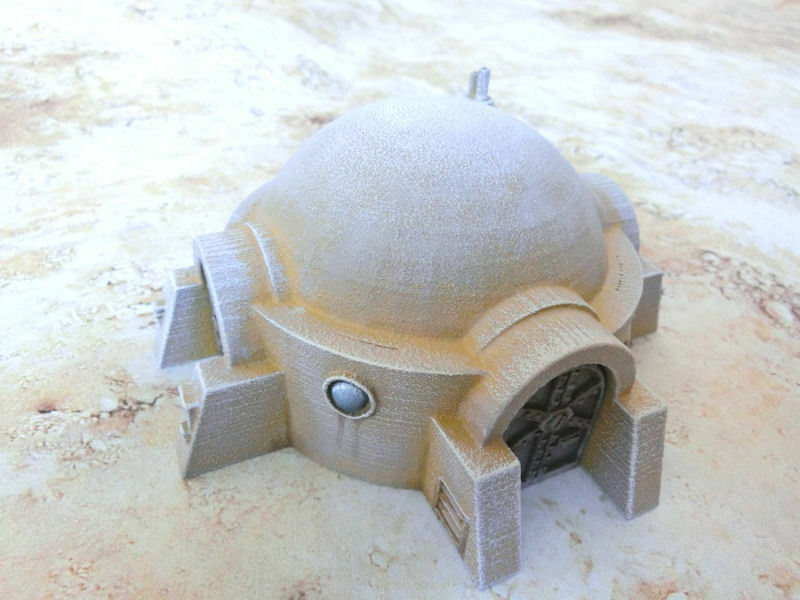 The Silver Helms set up next to the ornamental garden (left of photo), where I hoped they would be able to use their small size to dodge around woods and get the best angle for flank or rear charges. Euan had much better luck deploying his units, with only one small unit of crossbowmen turning up late. He started deployment by placing his Hydra right in front of my Silver Helms, about 15" away. With no chance of riding past it, and no room to maneuver sideways, I was in trouble there! His Hydra was backed up by 20 Corsairs and 20 Witch Elves. His Sorceress General set up hiding behind the mansion, as with her Familiar magic item (we were using old army books) she didn't need line of sight to cast her magic missile spells. At the other end of the board, Euan set up his Harpies, Crossbowmen and Cold One Knights on the main area of the port board. 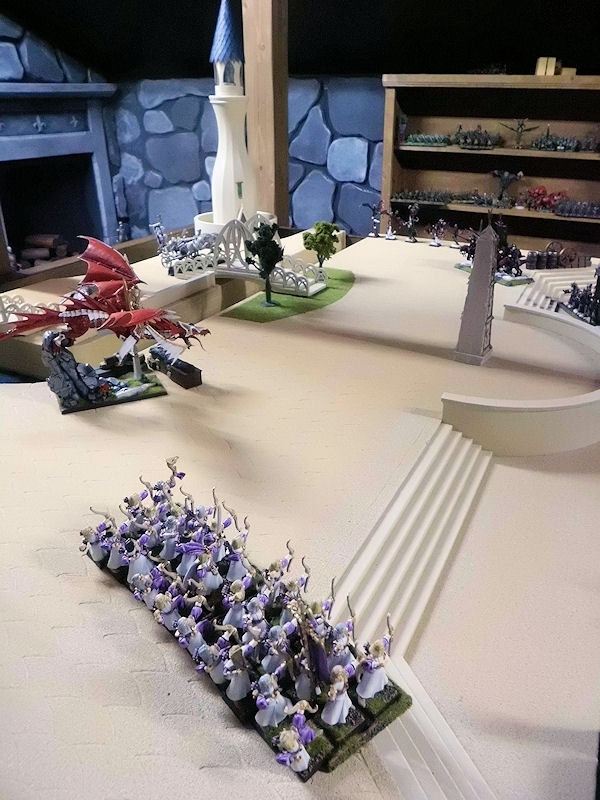 The only High Elf unit facing them in this area was the lion chariot! 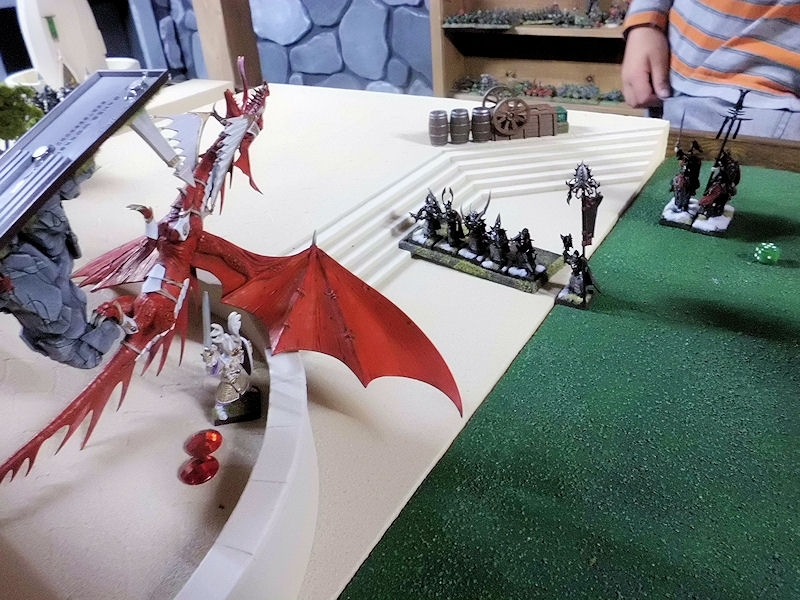 The High Elves decided to make their appearance, with a Giant Eagle and Lord on Sun Dragon swooping forward to guard against early charges in the port area. The Lion Chariot backed up a couple of inches, to prepare for a combined charge next turn. 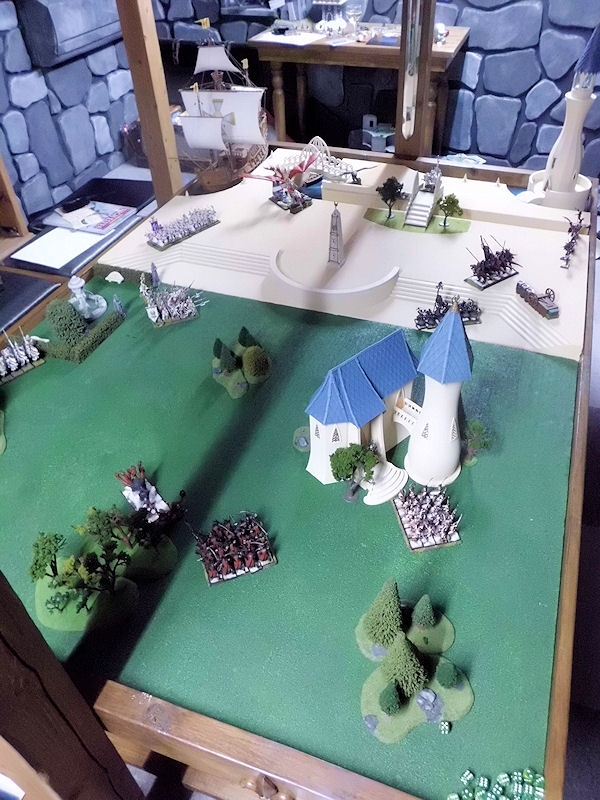 A large unit of 30 High Elf archers also advanced on to the board, ready to show those Dark Elves some real shooting! 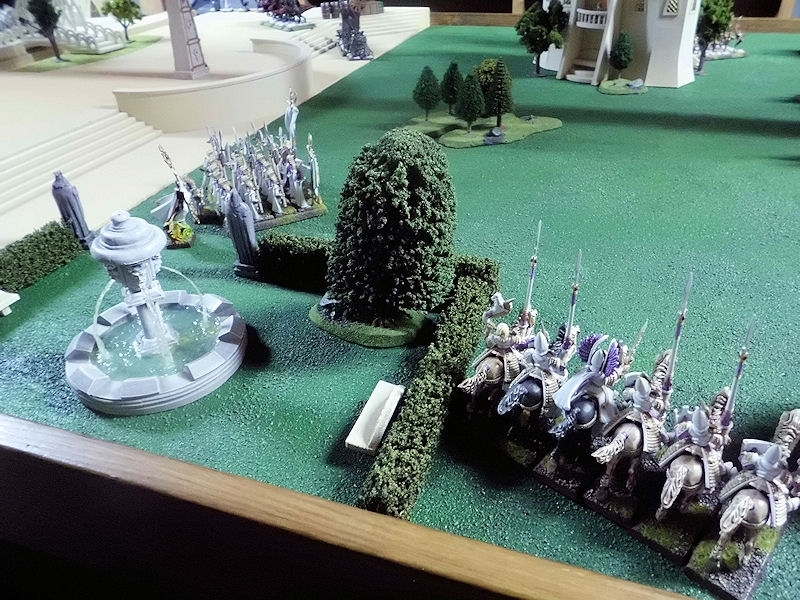 Over on the right flank the Silver Helms waited in position, while my main combat unit of 20 Phoenix Guard marched forward through the ornamental garden to lend their support for a second turn charge. My Level 2 Mage strode alongside them, ready to unleash his magic in the following turn. Euan's turn started with a failed stupidity roll on his Cold One Knights (who ambled forward a couple of inches) and a failed charge with his Hydra on my Silver Helms. So far, so good! And then his single late unit turned up. Very sneakily, his 14 crossbowmen and second Level 2 Sorceress came on from reserves and straight into the lighthouse! Oh nuts! I had completely discounted that area as a threat, because his crossbowmen couldn't fit onto the quayside. 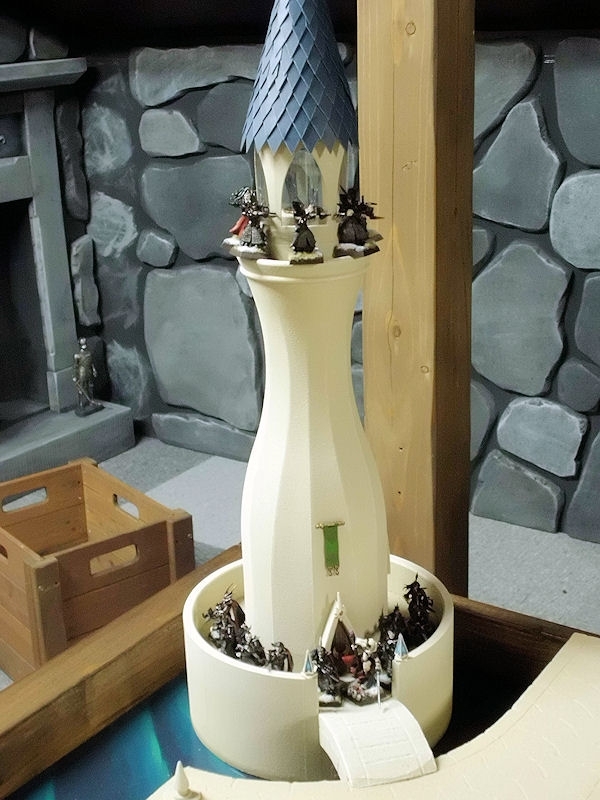 But, as Euan pointed out, the lighthouse's sea walls back onto the table edge, so he could enter the building and open fire in a single turn. Sneaky, eh? Euan's really getting the hang of this Dark Elf thing, don't you think? Euan lets fly with both units of crossbowmen and his Sorceress, and not only wipes out my Lion Chariot on the bridge, but also takes 2 of 3 wounds from my nearby eagle. Aaargh! A very good start for the Dark Elves! Ouch! Having effectively lost 2 flanking units in a single turn, it was time for some payback! My Silver Helms declared a charge against the Dark Elf Corsairs alongside the Hydra, but fail the distance roll, leaving them stranded in front of the Hydra! The elite Phoenix Guard march forwards to threaten the Hydra's flank should it charge next turn, or to prevent a double charge from the Corsairs. My Mage blasts the Hydra with 15 direct hits, but only causes 2 wounds on the beast. Hurt, but nowhere near out yet! My High Elf Prince on Dragon is too far away for a sure-thing charge on any of the Dark Elf units (damn those Cold Ones for being stupid and slow last turn! ), so he swoops forward to roast the central unit of Crossbowmen with dragon fire! 8 dark elves fall in the flames, but the remaining 7 stand firm. 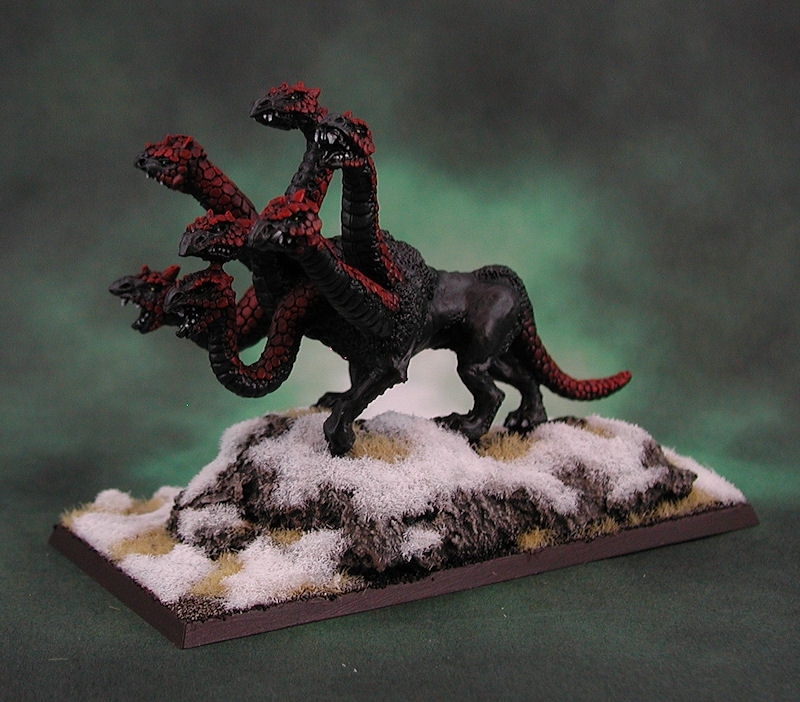 Euan's Hydra charges forward with a roar into the front of the Silver Helm knights. 3 knights fall to the many heads of the Hydra and the beast's breath attacks, with no damage done in return! Unsurprisingly, the Silver Helms flee off the table and the dark elf beastmasters successfully restrain their Hydra from following, instead turning around in preparation for another charge. Euan's Sorceress General is still hiding behind the mansion, but uses the opportunity (using her familiar) to blast magical fire at the High Elf Prince on his Dragon. Only D6 strength 5 hits, so it will hurt for sure... and Euan rolls a 6! 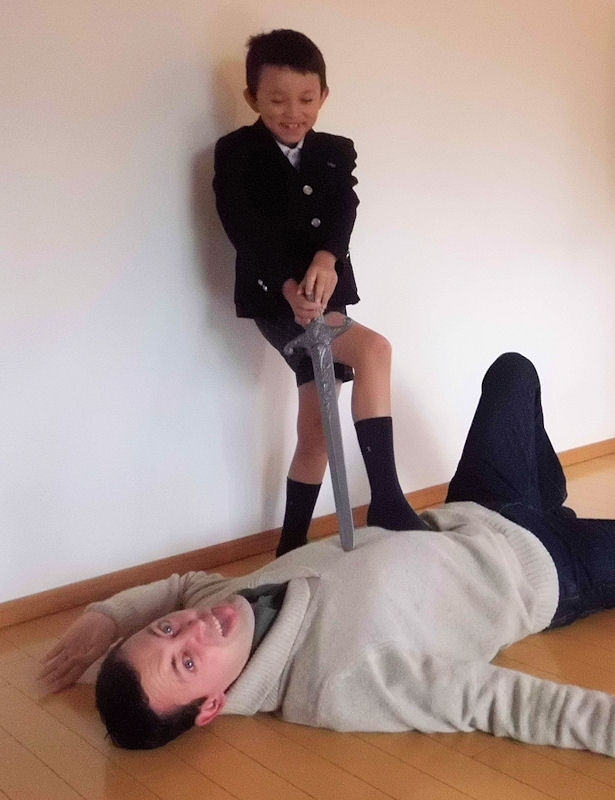 The first takes a wound off the Prince, and the other 5 smack into the dragon! All 5 hits wound the mighty dragon, and I then fail EVERY SINGLE save! The ancient creature from the dawn of time plummets groundwards, dead!! The crossbowmen then add insult to injury by taking another wound off my dismounted Prince! --gulp--. 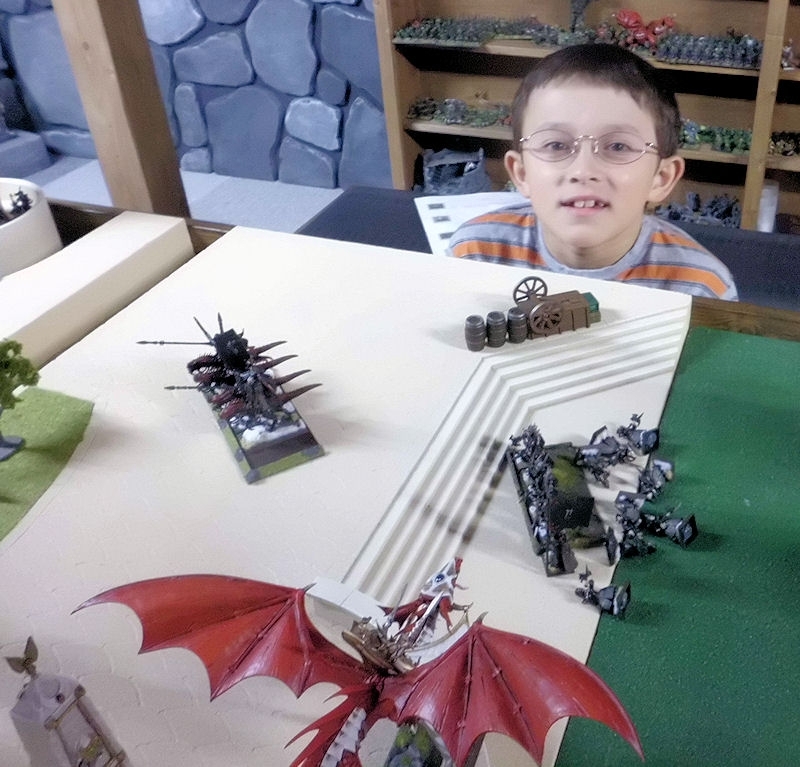 Oh my goodness - my mighty dragon slain with a single dark spell, and my Lord stranded in the middle of the board. Time to make a hasty retreat to the safety of the large High Elf archer unit. The only way I could do this was to run full speed towards the archers and gracefully leap a low wall onto the steps and safety. 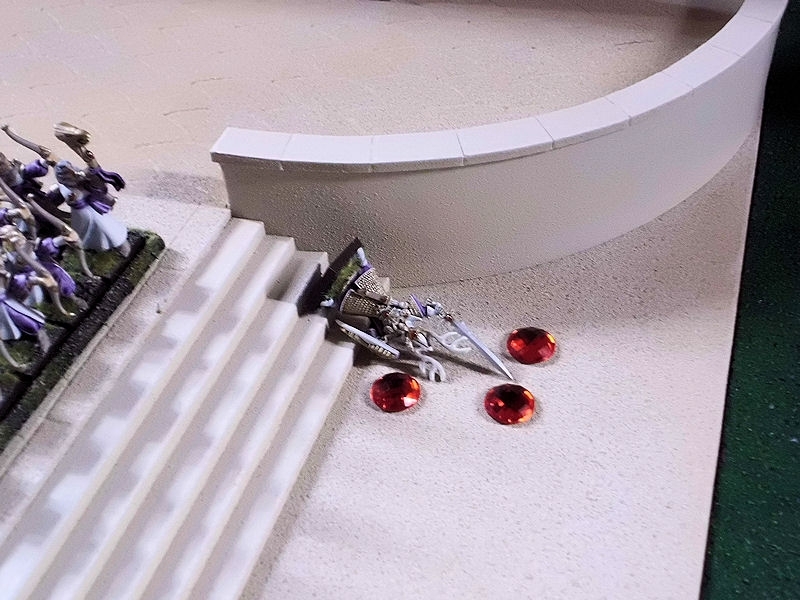 We decided (before the battle) that a dangerous terrain check would be needed to jump down from the wall, and of course Prince Golden HighPants (as we named him) obligingly rolled a 1, tripped over the low wall, broke his leg and knocked himself out of the game!! Nevertheless, my chance for revenge was at hand, as my Phoenix Guard charged into combat with Euan's Corsairs. 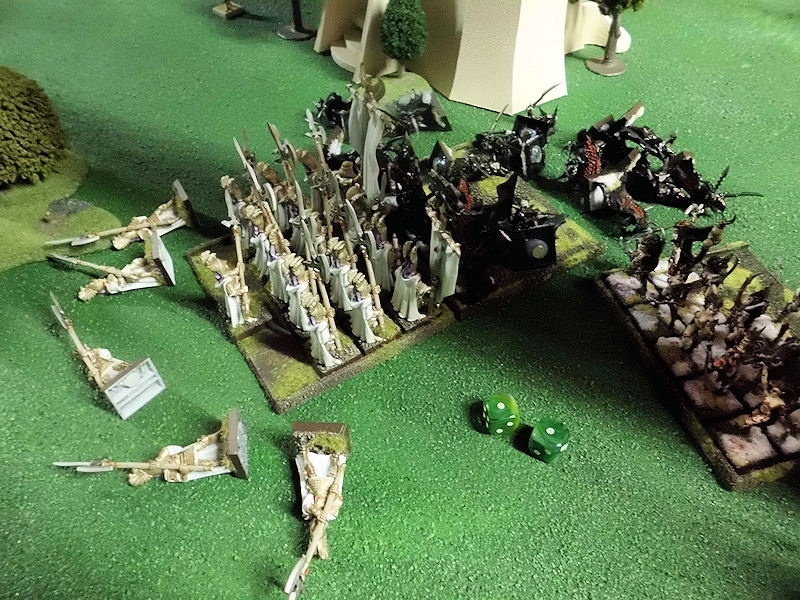 The elite High Elves smashed 13 dark elves from their feet, for 5 dead in return (all 5 out of 5 failed their 4+ ward saves). An easy victory, and one that would see the rampaging High Elves smash through the Dark Elf lines and into the rear to cause havoc. As you can see from the photo, Euan's Corsairs rolled a double one for their break check, and failed to run away! A 1-in-36 chance, and just when they needed it too! 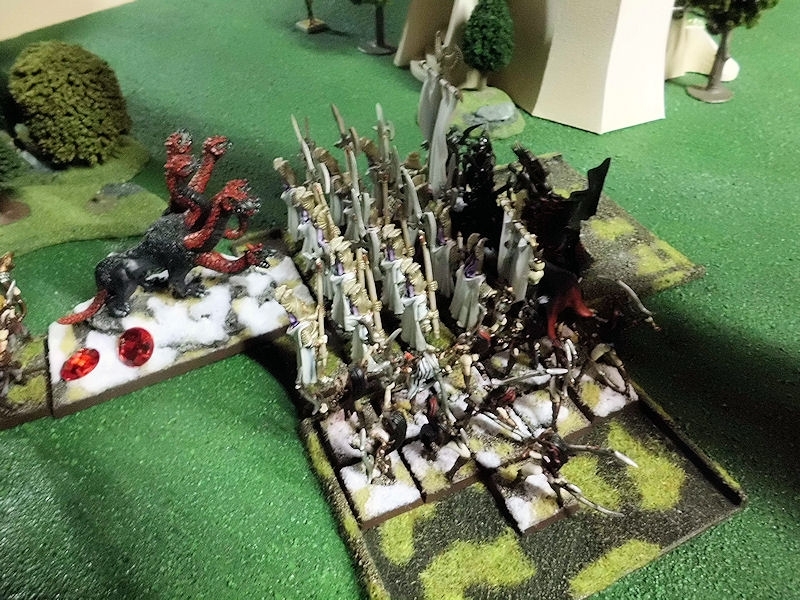 So my Phoenix Guard remained trapped in place, and at the mercy of the Dark Elves! ... which worked out very messily for the High Elves! 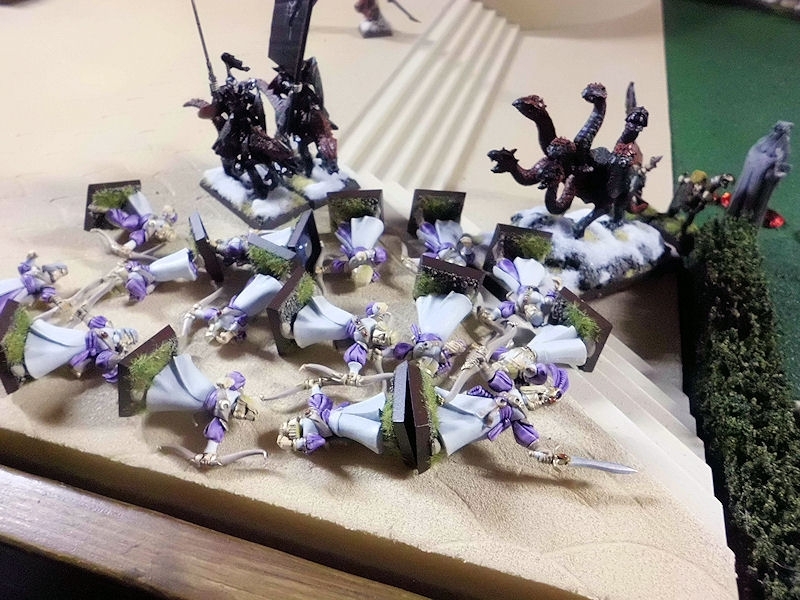 The Phoenix Guard valiantly wiped out the Corsairs to their front, but lost 12 of their number to the blood crazed Witch Elves and furious Hydra. 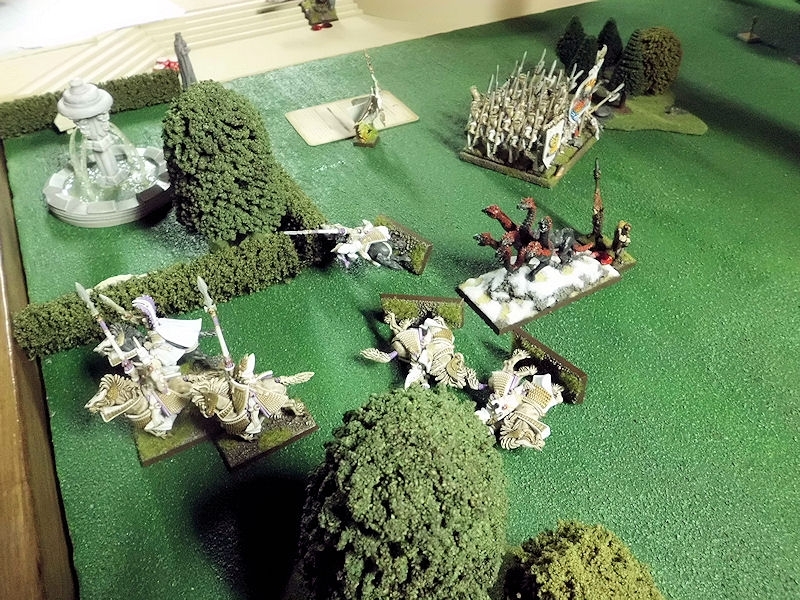 As their standards were torn down into the mud, the remaining High Elves lost heart and fled, only to be cut down mercilessly by the blood-splattered witches. 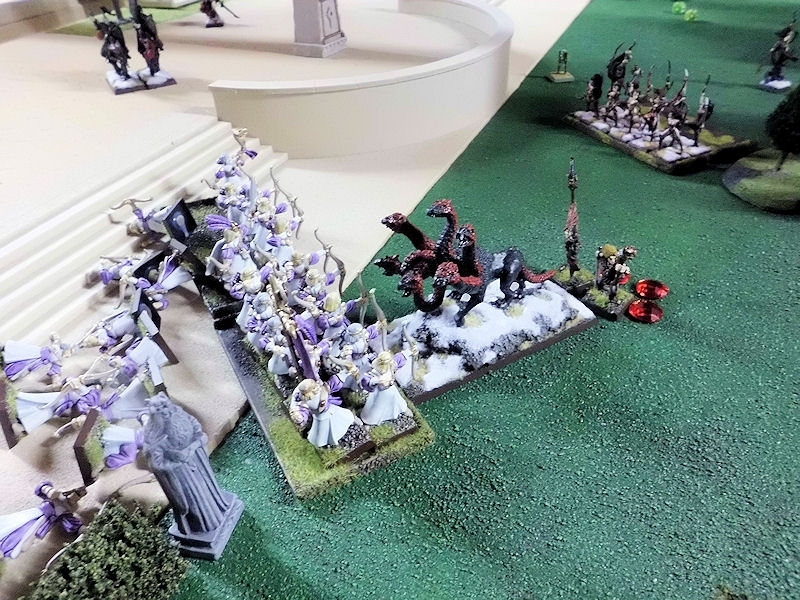 The High Elves by this midway point had lost their General and his Dragon, Battle Standard, Phoenix Guard, Silver Helms and Lion Chariot - approximately two thirds of the army! So losing was pretty inevitable, but they gathered themselves together and prepared to sell their lives dearly. 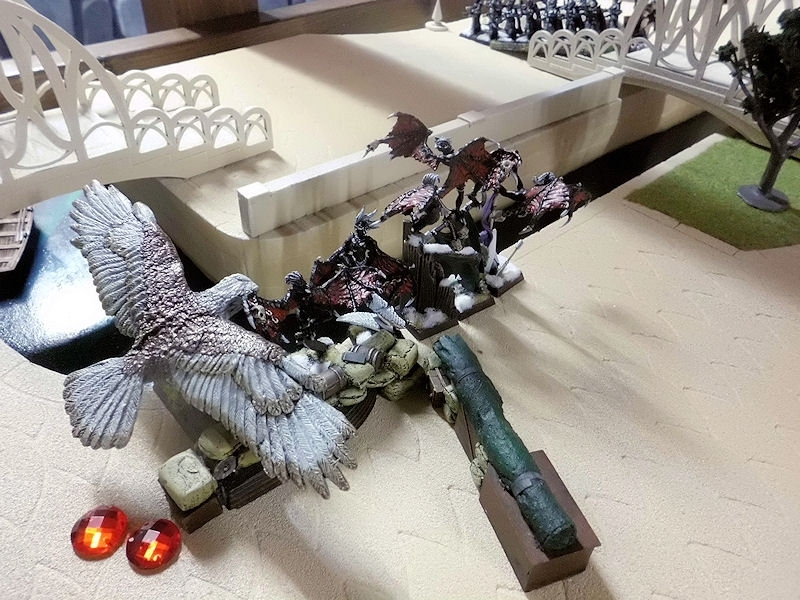 The badly-injured Giant Eagle swooped down to charge the Harpies, and although both sides failed to cause any damage, the cowardly Harpies fled from the fight, only to be cut down by the avenging Eagle! 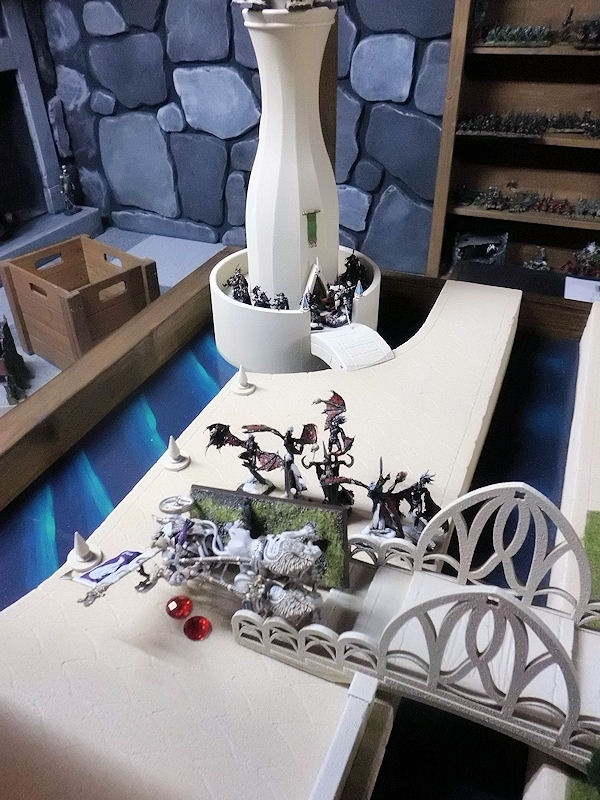 The Dark Elf Hydra attempted to charge the 30-strong unit of High Elf archers, but was too far away. 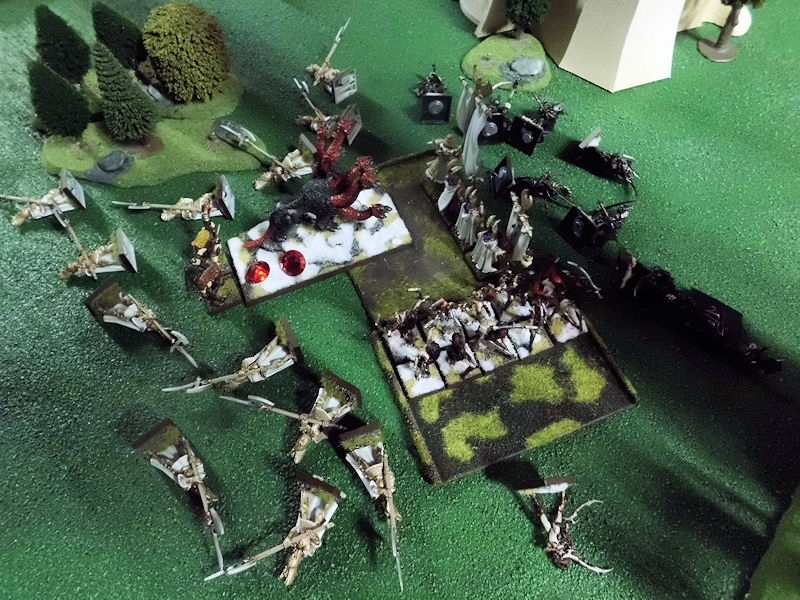 The remaining 7 dark elf crossbowmen in the centre of the board vented their hatred by charging into archers. 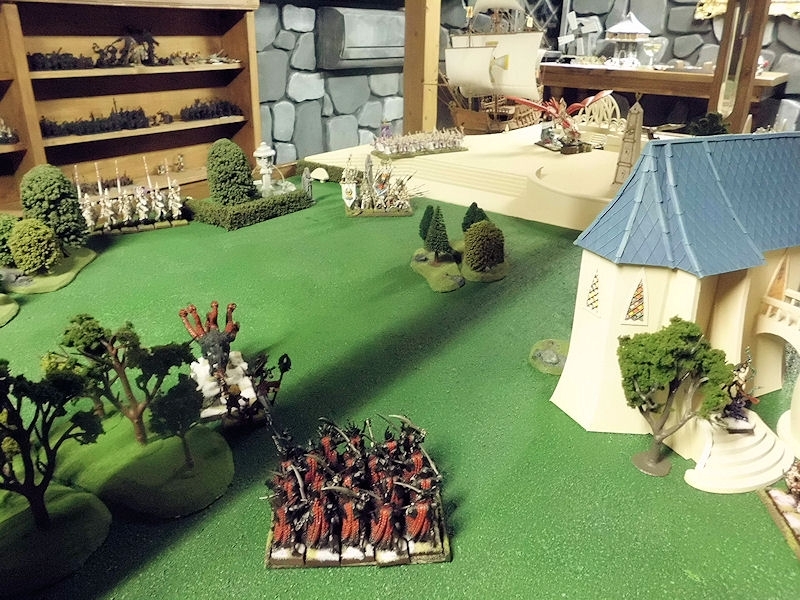 Despite an Assassin popping out to slay another handful of High Elves, the archers slowly cut down their attackers, and emerged bloodied but unbroken. The Hydra finally made a successful charge into the archers! Despite having been peppered by magic and arrows throughout the game, and fought against both Silver Helms and Phoenix Guard, this beast was still going strong!! One more head was cut from the beast, leaving only one wound remaining, but the archers fled from the carnage! So there we have it. 1600 points of High Elves completely wiped out in return for about 500 points of Dark Elves, in Euan's first full game of Warhammer. Let that serve as a warning to you all - Euan not only has the perfect sneaky skills to successfully run a Dark Elves army, but also has the most amazing luck!!!!! I mean, double ones when he needs to stay in the fight, 6 direct hits out of 6 when he needs to slay dragons, cursing me with ones when my lord is jumping to safety!!! awesome bro, that must have been a great time. well done. Euan is growing into a formidable commander.